There is a flurry of activity as the combined team of JLA and The 99 reacts to the current crisis. Batman uses the emotion-controlling mask of the Psycho-Pirate on Rughal in an attempt to deter Rughal from his evil plan. A triad of members of The 99 are attempting to reach Rughal's server system to disable the self-destruct sequence. The atom is also on his way. If they fail, there will be a massive explosion that will annihilate the City of the Future and release nuclear radiation throughout the Middle East. Suddenly, the entire city, still encased inside the Starro enclosure, begins to rise. We see that Superman is causing this by lifting the city from underneath. As seen last issue, Superman has just been freed from Starro's mind-control influence and is back to help against the Starro menace. Superman proceeds to carry the city away from Dubai and presumably back to its original location. Rughal musters the will power to resist Batman's attempts to control him. Dr. Chou, Rughal's assistant, manages to whack Batman from behind with a piece of computer hardware, causing Batman to crumple. Rughal prepares to flee the impending explosion using a jet-pack; but notifies Dr. Chou that there is no jet-pack for him. Dr. Ramzi blocks Rughal's exit and attempts to discuss the crisis further with him. The triad reaches the control system, as does Atom. They see a huge container filled with the small Starro's that have been attaching to people's necks and controlling them. Atom explains that Rughal's Plan A was to shoot the Starros out through launch tubes to infect the populace. But since the launch tubes have been disabled, Plan B is to blow up the city and disperse the Starros across the face of the Earth. Samda the Invulnerable points out that the bomb countdown is at 46 seconds. They need to do something fast. Atom suggests that they cut the power to the master clock, but does not know where the right circuit is. Batina the Hidden says that the triad will handle this. She tells Sami The Listener to listen for the sound of the relays clicking. She asks Samda the Invulnerable to surround the team in a force field in case they are not successful in disarming the bomb. And Batina continues to search. Through this joint effort, they succeed in finding and disabling the appropriate circuit. But it only freezes the countdown; it does not completely cancel it. They have done as much as they can do here; and must rely on the other heroes now. In Brazil, another triad is hard at work healing the earth; working to undo the effects of the earthquakes. They feel the presence of the Starro energies attempting to fight their progress, but they press onward. Mumita the Destroyer says that it will take all the JLA/The 99 heroes involved to counter Starros evil and destructive influence. Back at the City of the Future, Firestorm plus another triad arrive to help Dr. Ramzi against Rughal and Dr. Chou. This triad consists of Fattah the Opener, Bari the Healer, and Hadya the Guide. Rughal tells Dr. Ramzi that his efforts towards peace and understanding will fail because people just want someone to hate, and don't even care whether the reasons are true or not. Fattah the Opener goads Rughal, saying Rughal really enjoys being under Starro's control, being led "by a nasty little thing on his neck, riding him around like a dog". This enrages Rughal, who angrily pulls the Starro off his neck. Apparently, this Starro has been controlling Rughal the whole time. Rughal throws the starfish down on the floor and stomps the life out of it. Rughal scolds Fattah for calling him "Ruggie". But he acknowledges that Fattah's reverse psychology was more effective on him than Dr. Ramzi's "inspiring speeches". The team decides to use the Psycho-Pirate's mask to thwart Starro's influence on the populace. They theorize that if they can get enough heroes involved, they can muster sufficient energy to accomplish this task where Batman failed when he tried this on his own. Since Fattah the Opener has the power of teleportation, he can gather the heroes quickly. Batman addresses the assembled heroes and explains the plan in detail. They will project a large image of the mask across the entire city. Meanwhile, several members of The 99 work together to scramble the wavelengths of Starros mind control energies. The city is a dry run. Afterward, the same technique will be used to fight Starro's influence across the entire planet. The assembled heroes project their thoughts of peace through the mask; imploring people to stop fighting, resist the power of Starro, and think for themselves. This succeeds within the City of the Future. But to be effective on a global scale, some additional efforts will be required. Green Lantern and Dr. Light create an array of mirror satellites. The first triad of Noora the Light, Jabbar the Powerful, and Hadya the Guide will project the images of the mask far into the upper atmosphere. The second triad featuring Fattah the Opener, Jami the Assembler, and Bari the Healer will use their powers, magnified by the mirror satellite array, to create microfissures in the nervous system of each victim on Earth, fry each Starro, and then heal the fissures after the Starro is removed. The message of peace is projected throughout the planet. With concerted effort, the message has the desired effect, and Starro is defeated. When Hafiz, the newbie in The 99, feels pain from this effort, Darr the Afflicter uses his power to mute the pain. The members discuss what has happened, again emphasizing the important lesson, that citizens of diverse nationalities and cultures must work together in cooperation and harmony to promote peace and conquer common problems, just as The 99 does. A TV news reporter chimes in with the very same message. This discussion continues as the members of both superhero teams work to make repairs to the city. The TV announcer finishes his speech by emphasizing that the young people, more than anybody, have the ability to remake the world to embody this message of peace. Story - 4: This story is very allegorical. Clearly, Starro represents the evil influence of radical Muslim groups in the Middle East. When the heroes speak to the masses, telling them to stop fighting, resist the power of Starro, and think for themselves, the true message of this book is abundantly clear. I have enjoyed this series a lot. Yes the story has been rather simple. Yes the messages of peace, compassion, cooperation, teamwork, and respect for diversity have been repeated often throughout the story, and have not been delivered subtly. But if the target audience is rather young Muslim students in the Arab world, then this simple, clear, and direct message of peace is just what is needed. In this region of the world, where forces of mistrust and subjugation are hard at work influencing young minds, positive counter influences are needed. Sadly, this region of the world is plagued with sectarian strife and forces that promote religious intolerance and violence. But I have hope that forces of good can and will prevail. And if young people learn to admire and emulate heroes that represent tolerance, empathy, and unity, this can only help. In a world where such a thing as a "suicide bomber" is even possible, the world needs the voices of moderation to step up and provide alternative influences; to offer positive values and ways of thinking for the young minds in the region who are being victimized. 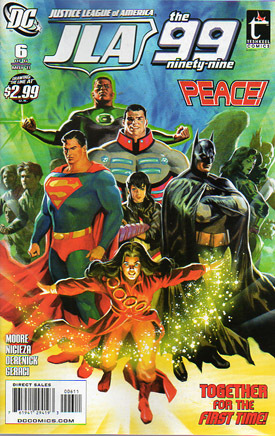 The 99 comic book is one of those moderate voices, attempting to make a positive influence in the region by promoting the virtues of cooperation, tolerance, and peace. I applaud The 99, and root for the ongoing success of this comic book. I am proud that DC chose to produce this joint series with Teshkeel comics. I need to comment on a specific story detail regarding Batman. In Batman's own book, Dr. Chou would never be able to sneak up on Batman to strike him. Batman is considered one of the world's greatest streetfighters. He would never make that rookie mistake. This scene was way out of character. Art - 3: The artwork was solid again this issue. It is a rather simple style, but worked well for this story. I really liked the two-page splash featuring Superman lifting the city in order to move it back to its original location. Cover Art - 4: Felipe Massafera produces an excellent cover here. I like this posed image, with Superman and Batman looking serious and determined as the de-facto JLA leaders, while Noora the Light creates a magical array of sparkly lights in the front of the group, rather like Tinker Bell. I imagine this cover would make a nice poster.